Because the article "Calls to Destroy Egypt's Great Pyramids Begin" went viral on the Internet—read nearly 400,000 times on FrontPage Magazine alone where it first appeared—as expected, the infamous "hoax" charge has been made to lull the West back to sleep. The vertical gash appearing in the smallest of the three Great Pyramids of Giza was made by a 12th century Islamic ruler who spent eight months trying to dismantle the pyramid. According to Daily News Egypt's "Another hoax: cleric calls on President Morsy to destroy Giza Pyramids," the calls from the Bahraini cleric I cited "urging President Mohamed Morsy to destroy the Giza Pyramids were issued from a parody Twitter account online, the Daily News Egypt has learned." That's all—that's the "proof" that this story is a "hoax": Daily News Egypt (DNE) "has learned" that someone was "impersonating" the Bahraini cleric. Unlike my article, DNE offers no evidence, no links, no proofs to back its story: "Just believe us—you'll feel better," seems to be the message. Some questions: If, as DNE suggests, this was a hoax to scare people over the rising influence of Egypt's Islamists, why did the hoax perpetrators choose a cleric from Bahrain, a small, foreign nation—why not parody an Egyptian cleric, which obviously would've made for a much more effective "hoax"? More importantly, why does DNE not address the other sources I had cited—including Egypt's very own Salafi party, which is on record calling for the elimination of Egypt's pyramids? Even Elaph, "one of the most influential websites in the Arab world," documents that both the Bahraini cleric and Egypt's Salafis are calling for the Pyramids' destruction. Needless to say, DNE's hoax charge was quickly disseminated by others, who added their own "logic." For example, after quoting DNE as evidence, one Kate Durham, writing in Egypt Today, focuses on portraying me as having an "agenda" (which, of course, I do: safeguarding the Pyramids). 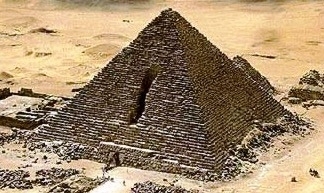 Likewise, after quoting the DNE report, RT's "Holy hoax: Radical Islamists call on Egypt to destroy pyramids" offered a revisionist history that truly resembles a "hoax," arguing that "demolishing the pyramids was prohibited during the 7th century—so the structures remained untouched." Really? This almost suggests that the Arabian marauders, who invaded Egypt in the 7th century, pillaging and destroying, were "respectful" of the "cultural significance" of the Pyramids—perhaps designating them as "tourist attractions"? What about 8th century Caliph Ma'mun, who—as this comprehensive English-language fatwa dedicated to explaining the Islamic obligation of destroying pagan monuments, including the Pyramids, puts it—"wanted to destroy the Pyramids in Egypt and he gathered workers but he could not do it"? What about 12th century Bin Yusif, Saladin's son and ruler of Egypt? He attempted to destroy the Pyramids, and had an army of laborers work day and night to dismantle Menkaure's Pyramid, only to quit after eight months, realizing the futility of the task, though his vandals did manage to leave a large vertical gash in the Pyramid's north face (see here). What about Egypt's Mamlukes who, with the advent of gun powder, used the "pagan" Sphinx for target practice, effacing its nose? After citing the DNE report, Huffington Post's Llewelyn Morgan offers his assurances: "Let's be crystal-clear about this right here. The answer to the question in my title ["Are the Pyramids Next?"] is a mile-high, neon "NO". The pyramids of Giza are under no threat whatsoever, and neither is any of the rest of Egypt's glorious archaeological record." To read that that you'd think that the only Muslims involved in events at Timbuktu were the ones doing the vandalism. But of course it was Islamic buildings that they were attacking. Ansar al-Din, the al-Qaeda-affiliated zealots in northern Mali, consider the traditional Sufi practices of Timbuktu to be heretical. This is strange logic, indeed. Because the Salafis of Mali consider Sufi buildings insufficiently Islamic—as all Salafis, Wahhabis, and "radicals" do—according to Morgan, that is proof positive that the Pyramids, which are purely pagan, are "under no threat whatsoever" from Egypt's Salafis. If Morgan's point is that, by destroying Sufi Muslim shrines, the "al-Qaeda-affiliated zealots" are not practicing "true Islam"—that's still neither here nor there. All Salafis—whether in Mali or in Egypt, whether "al-Qaeda affiliated" or not—reject Sufism as a heresy and pagan Pyramids as worse; and in Egypt, the Salafis are now out of the prisons and sitting in Parliament. All of these apologists are unaware that the Koran portrays pre-Islamic Egypt's Pharaoh as the quintessential infidel, with the result that the Pyramids, the handiwork of Pharaoh, have always been seen by the pious as an affront to the total victory of Islam in Egypt—hence why any number of Muslim leaders through the centuries tried to lay low those defiant symbols of Egypt's pre-Islamic past; hence why such calls are again become vocal. Indeed, here's the latest bit of evidence: just published in El-Balad, on July 17, "Egypt's Justice and Development for Human Rights warned against the ongoing incitements from a large number of men of the Islamic religion to destroy the Pyramids and other Pharaonic antiquities, deeming them pagan symbols of pre-Islamic Egypt…. these calls have greatly increased after the victory of the Muslim Brotherhood candidate, Dr. Muhammad Morsi." These calls are neither a joke nor a "hoax": the same mentality that sought to destroy the Pyramids in the past, is the same mentality that is gaining mastery over Egypt in the present—with the exception that, if destroying the Pyramids was an impossible task then, it is realizable now, a wonderful feather in the turban of any aspiring "champion of Islam"—a feat that none of the greatest caliphs and sultans could accomplish, try as they might. Accordingly, those who understand that the Great Pyramids belong to all mankind, not just Egyptians—and I say this as a Copt, the nearest thing to a living descendant of Pharaonic Egypt—must safeguard their preservation, and not abandon them to Islamic zealots. Still, the "leftist" mentality remains oblivious, as if to say, so what if Islamic doctrine and history is replete with the destruction of pre-Islamic monuments from one end of the Islamic world to the other, including several attempts against the Pyramids? So what if, at this very moment, Muslim fanatics are destroying artifacts in the name of Islam, in Mali and elsewhere? So what if Egypt's Salafis are on record calling for the destruction of the Pyramids? Not to worry, the Huffington Post et al say it's just a "hoax." Nothing to see here, folks; go right back to sleep. Incidentally, these media outlets and their writers are the same ones who, when the day comes and the Pyramids are attacked—just like when the Twin Towers were attacked on 9/11—will wring their hands and shake their heads, wondering, "Who knew?" "How?" "Why?" Then, because they still cannot comprehend Islam's teachings and history, they will, as ever, cite "grievance" or "poverty" or "political oppression" as the real reasons behind this latest atrocity, calling for more Western engagement and head-sticking in the sand. And so the vicious cycle of Islamic intolerance followed by Western appeasement will continue, ad nauseam.